The Transition to the Google Answer Engine: People using the Internet want to find answers to their questions as fast as possible. When trying to sell your products, it’s critical to prepare for prospective buyer questions. Google answer engine optimization is revolutionizing search. Users want the answer, not billions of web pages, not pushy ads. So Google ranking systems born out of many “answer patents” sort through the hundreds of billions of web pages crowding into the Search index to give users the best answers. To make it easier to gain solutions, Google Maps launched Questions & Answers right within a business’s Google Listing. 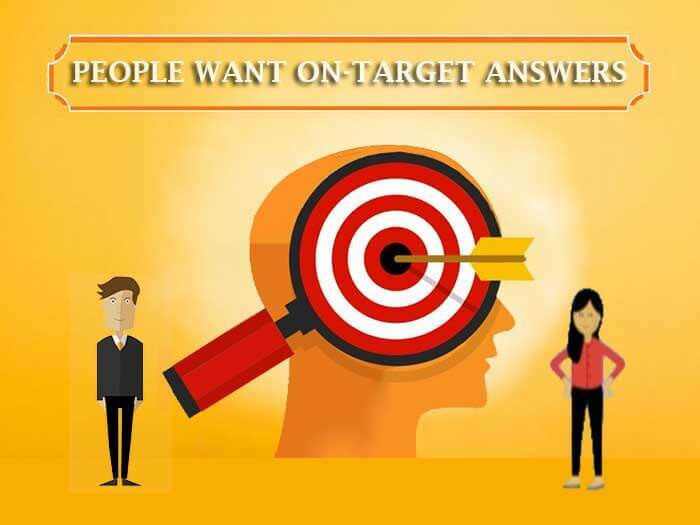 This helps prospective customers to ask the company their questions and give the business owner another way to provide a fast answer. When first introduced in August 2017, it was usable on Android with other options rolling out later in the year and has quickly become an essential aspect of effective SEO. The Google Answer Engine is now core to most if not all aspects of search. Google’s answer’s engine runs on top of Wikipedia and other trusted sources. One key to getting more of your content sourced in Quick Answers is increasing your website’s trust factor. These highly visible answer cards are giving users a new way of getting quick answers to their questions. Getting your content in featured snippets can lead to increased relevant traffic on your website. I This post will help you learn how to create question-and-answer style content that’s user seem to prefer and that is Google-friendly with the intent to gain targeting Featured Snippets. Companies that demonstrate relational qualities within their mission and value alignment, innovation, and collaboration, are poised to welcome consumer queries. One demonstration of providing exceptional customer service is letting your clients know that no question is too big or too small to ask. Conversational AI that leverages Chatbots and is a trendy way to help them reach your business anytime and anywhere. Creating the best products and services begins by investigating the questions asked by hundreds of buyers in surveys and in seminars letting them describe their ideal experience and then turning this research into relationship building communications. This post can help you to better understand how to edit your schema to add phrasings so Google’s Q&A can answer more questions about your industry expertise from your data. If those code implementations are not accurate, your answers may not be shown as often. Winning clicks on mobile is hard. On mobile, Google’s focus is to be an “answer engine” more than a “search results list”. Now that Google is monetizing the SERPs heavily, there are fewer winners than there used to be. To win, you must align with what users are looking for. What is Google Q& A? 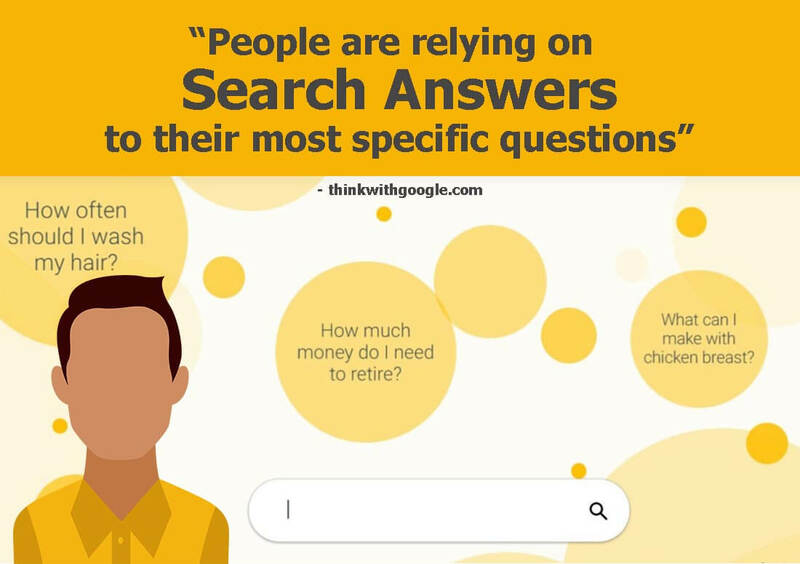 Google Q& A became common knowledge in August 2017 when introduced as a consumer-facing, crowd-sourced FAQ results feature. 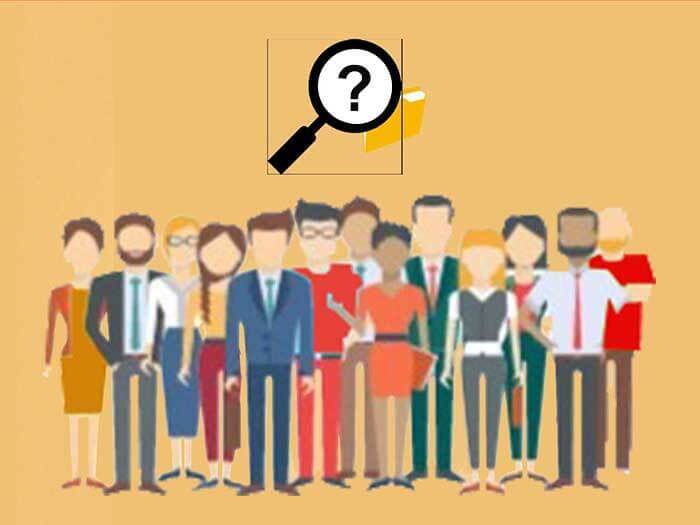 It is much like the Ask the Community feature on Yelp, TripAdvisor and other forums, that aids consumers (and businesses) by making it easier to ask and answer questions about a particular business within their local Knowledge Panel. These results can show directly in traditional search results as well. Viewers can quickly indicate the answer’s usefulness with a quick positive or negative vote to questions and answers. Google uses this to further determine their order, and where they might appear, and future answer results. People are asking questions, a lot of questions, especially before buying on an e-Commerce site. Google’s intent for its local Q&A feature is to provide those consumers with quick, concise, and enhanced details about a business. These informational snippets will help prospective buyers to find meaningful, in-the-moment answers to questions, making their decision-making process possible directly from the Knowledge Panel. It is a leading SEO technique that can help your business provide user with more valuable content. Questioning is the art of learning. whether to choose the right product, resolve a problem, or to find the best service provider. Learning to ask important questions is the best evidence of genuine interest that there is, far surpassing the temporary endorphins of coming up with the most correct “answer.” Unless we are talking about search. Then it is very rewarding to provide the answers that someone needs. What is a Google Answer Card? A “Google answer card” is a SERP feature, usually displayed in a light-gray box, that occurs above the organic results and seeks to directly answer a specific question. From March 2018 forward, Google has been removing search results from specific queries where they believe that it is possible to answer a consumers query, without sending that traffic to a third-party site. Glem Gabe provided the above example on Twitter on December 5, 2017*. The intent is to improve the speed of results returned to users. Google never skips a beat at putting it “Users First”, as we can see from the Zero Result SERPs position given to these answer cards. Google search results now favor showing the Best Answer within their Answer Cards that typically win a position above everything else. Since their appearance in December 2017, people have been eager to learn how to achieve this stellar result. Scanning the Google developer documentation only offers hints of question-answer schema markup. Readers seem to love an answer that has been designated as the best response, typically on a Question/Answer site. Some sites lean on community opinion and/or the opinion of the Question author. We can find no available proof that featured snippets must have Schema Markup, and yet by examine code we often find the “best answer” highlight within the Answer card is accompanied by acceptedAnswer and upvoteCount (a property showing how many individuals have voted for that answer, as often is used in a forum or community). What are Questions & Answers in Search? You can find user questions by joining the chorus of inquiries found in Google autocomplete. Questions and Answers on Google Maps or directly on your web pages allow business owners to provide specific answers to specific questions directly. Your Google business listing is more important than ever to help you reach potential customers. Digital marketers can now anticipate FAQs by adding commonly asked questions and their respective answers wherever possible online. As Google offers new ways to do so both onsite and offsite, it is an ideal SEO task to complete. Both retailers and Internet can both rate content to boost its Q & A positioning and red flag content that is incorrect, misleading or spam. SEO’s that are watching their data closely are seeing and content that answers consumer’s questions is flourish today. It is not surprising given the mobile-first index, the increasing number of voice assistants, and machine learning advancements. With a mindful, Artificial Intelligence is taking marketers right back to the basics of having one-on-one relationships with customers. Customers are asking new questions every day that tell us what they need. You can decrease their time to gain that outcome from you by preparing now to answer their key questions. It is best to build content that muscles up your organization’s answer library to become better problem solvers and be there when your customers expect it. That is where the current and next competitive advantage is. Users have left a trail of history questions that you can glean intent from. Rich answers are similar to the Knowledge Graph, giving people direct information to their queries rather than forcing them to hunt through websites. However, they have one crucial difference: they’re gleaned from existing websites, rather than coming from Google’s knowledge archives. These may include an excerpt of trusted text to directly answer a question a user typed, or a carousel of varied historical characters or statistics associated with a certain time in history. Why The Push for Faster Answers? Just like Google is committed to building a database of the world’s knowledge, which will improve Google’s ability to answer questions posed by its users, so you can make your website answer-rich. You can spare your phone answering staff from answering the same question repeated or the hardest questions by putting them to print. Your site can provide these answers any time of day, and potential customers with quandaries and doubts to hurdle will appreciate having the ability to learn what they need to with ease. All of us, from companies to consumers to vendors can find answers easier than ever. Robots are connecting user intent behind search queries to the right material at a pace that surpasses human ability. Google Launched its Knowledge Graph to provide user’s answers faster; it is less about providing links. Google Posts show up right there and not at the bottom either. Always leave your contact details so buyers can reach you even if Google gives them answers from your content without their need to go to your website. Make it easy for some to simply call you or gain directions. Machine Learning has become so humanlike that its machinelike qualities are becoming harder to detect. Legend is a new voice for Google Duplex, an experiment that was unveiled at Google I/O 2018 that allows the Assistant program on an Android to make phone calls on behalf of a person. It can ask questions and serve up answers without necessarily being detected as a robot. Above is an example of what a direct answer box looks like. Direct answer boxes often provide sufficient information to forgo the need for traditional organic search results altogether. With Google may be tiring of all the sites that pay little regard to its guidelines and wish to simply take more control over answer content that users are looking for. This way it has can take charge of user satisfaction—as well as the types of content that are listed in its Google search results. This can limit liability in some cases, as we have seen Google under fire for serving up the wrong answers. We would probably all do the same if we were the feet in the shoes of an answer engine. Google seems to be returning more direct answers in visual search results, with “10% of mobile SERPs now containing a direct answer box”, according to RankRanger. It’s latest report on mobile SERP features in the US. This represents an increase of 1.4% more direct answers compared to last month. That’s one of the greatest month-over-month increases of all search features that appear at the top of the page. RankRanger report on direct answers in SERPs is key because it illustrates that Google is placing more effort in delivering immediate answers to queries. It pays to weigh the benefits to searchers. While some may consider it a disservice to publishers. If searchers are pleased with their results in the SERPs, they will find what they are looking for and be less likely to move on to another site. Add the service of a Digital Assistant for conversational AI, but first, you need your technical SEO correct. As search marketers, we always strive for better: helping business to answer service questions, product inquiries, and follow-up communications that provide clarity, et cetera. Useful content will always be a kingpin in the SEO world. It takes technical steps to implement mark up your answer-rich content, but combine that with aggregated positive reviews and you’re solidly prepared to be a key answer in voice search today. Designing your website and content for your customers is as important as your products so that people will find and buy them. For web designers, developers and product managers, this often requires a change in mindset. If your focus more on providing the answers people are searching for, more likely they will come. Google’s Knowledge Graph is continuously expanding its size, use, and ability to answer more user queries with short and rich answer statements. On April 18, 2018, Search Engine Journal reported that Google is returning more direct answers in search results, with 10% of mobile SERPs now containing a direct answer box. 23.54% of page one SERPs include at least 1 AMP result. Ads appear on 33.24% of page one SERPs. Rich Cards appear on 20.89% of SERPs, an increase of 5.64% over last month. 45.75% of SERPs include sidelinks, an increase of 13.61% over last month. Google patents reveal the company’s dedication to crawling facts on the web from which it can better answer query strings. This aids in assembling ontologies in a storehouse of topics on the web that they can source to answer questions when serving results for question-answering searches and if they deem it best to show featured snippets. One can see how the web is developing in an expansive database, according to the 2014 Google abstract called Biperpedia******. “A computer program product and method provides a question and answer service that accepts an initial first question from a user and analyzes the question by a first generation subsystem to generate a first answer. A second generation subsystem of the question and answer service is configured to generate a second question based at least in-part on keywords from the first question and the first answer,” according to the Google patent filing US9471668B1. Another answer application claims priority to U.S. Provisional Patent Application Ser. No. 61/159,959, filed Mar. 13, 2009, entitled “Question-Answering System And Method Based On Semantic Labeling Of Text Documents And User Questions” and to U.S. Provisional Patent Application Ser. No. 61/159,972, filed Mar. 13, 2009*******. Remember that answer content is just one form of content that you need to provide. Evergreen content educates audiences. Case studies on topical content, informational content, seasonal content, statistics, walkthroughs, product reviews, how-to guides, start-up guides, informational lists, industry roundups, best practices, checklists, tutorials, podcasts, failure and success story, pros and cons articles all have their place. Answer content focuses on common problem solutions. Google is unquestionably investing in restructuring its SERPs with a focus on user-friendliness and convenience, and part of that may include squashing organic results in favor of new, more intuitive answers, especially if sites continue to heavily self-promote. Google’s real consumer is the users that rely on their products to meet their needs. The average person who uses search may not be thinking of Google, but your company can be thinking of them. * You become more valuable. If your business will focus on current questions that are going unanswered, you can fill a real need. Your answer content becomes more valuable. By providing a means that the business owner and consumer can meet for Q & A provisions, Google’s intent is to help users make decisions more quickly about who to engage with for business. * Uncovers ideas. Once you know what your ideal consumer is asking, you can uncover patterns based on regions, product categories and implement those insights into your web store design to provide better communications along the customers’ purchase journey. * Reaches a global audience. Targeting a lower-grade reading level makes your content more easily understood by a global audience. Content that is written using over-technical, company-specific or intense legal jargon may result in customers who abandon your self-service FAQ page. * Strengthens your library knowledge base. Being in touch with consumer questions help you align your supportive answer content with your products and services as to avoid content gaps or overlaps in your knowledge base. * It is a road to quality content. If you documenting the changes to make to your answers over time, it will help you to more efficiently manage and provide fresh quality content. Concerned About the Spam Q and A Algorithm? ANSWER: It was a big deal to businesses last year when Google’s Questions and Answers surfaced in the news. We are not aware of a credible algorithm that currently handles spam questions and answers adequately. No one quickly lines up for the task of sorting through spam reviews in our experience. At the same time, it is important to respond to all business Q&A’s, especially if someone flags it. A credible spam algorithm is present because Google is watching to find answers worth sourcing. Prior to launching, a body of Google TC’s expressed concern regarding the open door this may create for Spam together with the struggle that business owners may face to moderate the Questions & Answers on their own. Who wants to face having a “ red flag” a wrong or spammy question or answer show and be attributed to them. Google reviewers are check for accuracy; so should you. A Google Local Guides may be helpful. Writing for voice-activated searches means have a writing tone that fits natural language. Your content writers may come up with the best-written page on a search topic, but it must be relevant to someone’s search query or these efforts may be wasted. Content that can be quickly matched to answer a mobile user’s intent will be favored for serving up an answer to. It’s less about publishing lots of content and more about content quality. The best and fastest wins come from improving your existing content and adding the material that someone is seeking. Today we need to optimize for ‘eyes-free technology,’ or voice search; that is when the searcher skips our traditional screens when seeking for an answer. Google’s machine learning and algorithms update continually to deliver voice responses and answers that are concise, grammatically perfect, use natural language and are explicit to the query. That does not equate to thin or short content unless it is a simple fact query. Example question: “who was the presiding president when the Whtie House developed its first website? The simple answer is Clinton, according to the White House Historical Association*****. Google invites raters and opens feedback to sure that the answers it provides are acceptable and useful across several dimensions. This means writing out answers to the top questions people ask just as if you were speaking to them in person. Use this style when writing new content. You will see better results if you can to deliver the message on your Web page in this conversational manner. Get right to the point. Avoid being salesy or corporate here. The simpler the answer the better for short spaces like on Google Maps. But the best answer content delves into supportive data and answers secondary questions. Dr. Peter Meyers of Moz contends that “Questions that can be very easily answered should be avoided. Answer how-to questions and questions with rich context instead”****. He suggests a pyramid approach. Brilliant content writers can keep a lengthy read engaging all the way through. Yet, the day-to-day reality for most writers is that reader’s attention spans are short. If multi-tasking or faced with many answers, use H2 and H3 subtitles so it is easy to skim directly to the information they need. Most days, that means giving people a structure that’s familiar and clear without demanding that they read all of any one webpage to find the answer. In 2017, Google added a chat feature to allow businesses to chat directly with users. This feature has already used across the US and through iOS operating systems as well as Android. (4) Once you begin using test messaging to answer questions, you’ll receive an average response time. To improve your chances of appearing in the Knowledge Graphs, it’s essential to plan around user intent when structuring your site and curating new content. An optimal way to achieve this is to preemptively answer top questions users ask. This may mean creating a series of pages, each on a particular topic by providing brief and meaningful FAQ style responses to the key questions your audience is likely to ask. Answer the questions people ask while you are logged into your Google My Business dashboard. This helps others as well as the person who asked the question to see the response coming from you, the owner of the GMB listing. Prepare your responses for voice searches, even for B2B clients. Implement micro-formatting structured data to help Google with their SEO process as they further develop their algorithms. Structured data and conversational content are two major ways to help ensure that when people ask Google Home, Siri, or Amazon Echo and say something like “Hey, Google, who’s the best implant dentist in Plymouth, MN” the voice assistant serves up the best business. Monitor it on a regular basis. Don’t begin and forget it. Find out the reason behind the query and what they are hoping the answer will solve. Google has functioned for a while like they know that people want to use Maps for reasons other than simply getting from one place to another destination. It starts conversations, too. Some even wonder if it is a type of “answer network”. Google knows that people favor immediacy. Leverage this feature to display your knowledge on hot topics when out-of-towners come to visit and shop. If you’re going to provide a value-added answer to a topic that changes from day-to-day, like SEO, it’s best to be well informed. Knowing the nuances of a topic can make all of the difference inadequately answering. Step up to the plate if you are a topic expert who can address what is trending. Markup it up with Google Structured Data and keep it updated for but best results. Especially consider revamping thin pages with outdated answers. In this manner, you can build trust as an industry expert who stays in the know and leads with fresh solutions. If the query really only applies to a segmented audience, use niche specific keywords that are generally within that audience. That is, by knowing the key pain points on common topics or genres within a niche, your page can be the best answer. Long-form informational keyword rich answers may produce a following that that quite weak content cannot do. Google has reported that 15% of daily queries are new and never seen before by its search bot. In 2007 it stood at 25% of search queries, but the interesting part, this 15% stat was first posted in 2013 and now five years later it remains that high. This implies that they checked the stat and find it unchanged. Consider how long it takes you to create a new page that thoroughly answers a specific question. Consider how many times parent tires of a child’s numerous question before they bore of asking them. Answers are a key part of life let alone search. To keep up, both Google and your business need to find better ways to get those answers to the people asking the questions. Search engines are now more sophisticated in surfacing what a user is really hoping to find the answer to. The search Engines original intent was to deliver results based on keywords used. Given the rise of voice assistants and how popular they are with Internet users, search engines like Google, Bing, and Yahoo have improved their algorithm for AEO. Which means that it is not just people but search bots that favor websites that are richly optimized for voice search, that means having content that answers frequently asked questions. You will have to sort through some of the off-beat questions asked on the Quora. Set aside frustrations due to many of the answers provided by so-called “experts” that offer old or differing solutions. The process is still insightful because it offers an understanding of the thought processes of searchers who are looking for answers on a particular topic. Create a process to gather data from Quora on as many of these “questions people ask” as you want to so that your business can gain a competitive edge by being relevant to user’s needs. One steadfast rule of user research is to not ask yes-no questions, like “Are you happy with our product?”. My favorite construction for this is “What do you like most about our ____?” Refresh their memory in your followup communications as to what they said earlier to refresh their memory and get them talking. By asking how it’s different from their previous experiences, you can encourage them to jot down what they really need and wonder about. After participants provide core answers and explanation, create a great opening for probing further. Leave a space for them to offer why. Or to provide their ideas for improvement. You can learn a lot if your survey questions are strategic and you don’t over utilize them. 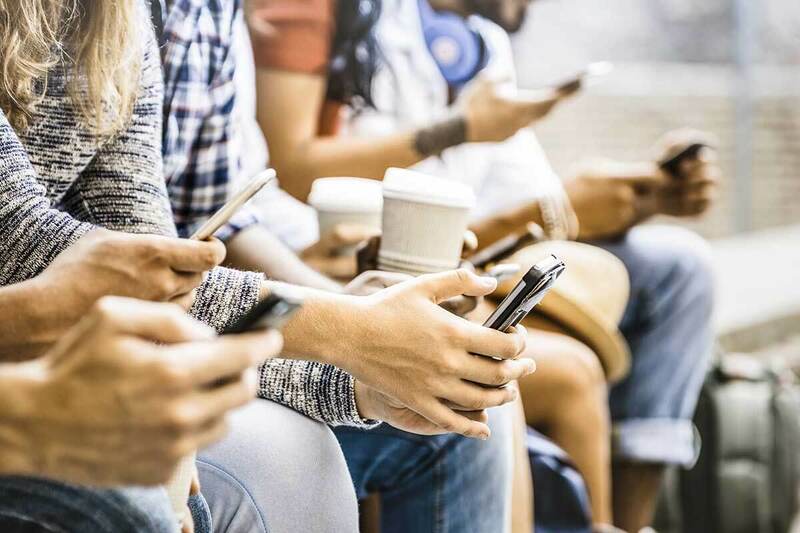 Recent research of over 850,000 search queries reveals that “Google served up some form of direct answer 19.5 percent of the time”, according to Eric Enge, CEO of Stone Temple Consulting and Perficient Digital. Enge was quoted by James A. Martin on cio.com for saying, “A year ago, Google users would have received direct answers about 4 percent of the time, according to Enge. The May 6, 2015 article titled How voice search and Google ‘direct answers’ are changing SEO, contrasted how Microsoft’s Bing search engine currently delivers direct answers just 1.1 percent of the time”. Businesses need to first determine whether a consumer’s question can be sufficiently answered — many questions make false assumptions or are just too ambiguous to be answered concisely. You want to provide trusted and factual answers. And you need to know just what questions buyers are asking. Reevaluate your marketing goals and business KPIs to determine how to better align your efforts on making your customers happy by answering their questions. Develop a culture of gaining the feedback you need to keep customers happy and turn them into advocates. All of these are ways in which you can improve your buying journey and make your customers happy. Prospective buyers base their quality-of-shopping experience on how fast they can find answers to their questions. Give your customers the reliable, relevant, personalized communications that they crave, and you’ll reap the rewards of a trusted relationship that produces repeat customers and lifelong brand advocates. But remember: No two businesses are exactly alike. While you can learn from competitive research, find what works for yours. Take the time to clearly define where you excel at offering solutions that your customers are asking for and where you currently have a content gap that misses providing remedies and responses that empower shoppers to make better decisions. Determine where you’ll see the biggest ROI and then focus your efforts on answering user questions in those areas. Craft your marketing messages to teach and inform your leads as much as possible so that they can confidently pulling the trigger on a sale. This means answering all key questions before you ask for their money. The closer you get to addressing buyers questions and concerns in advance the better. Your content can show them you know what they need, emphasize with their concerns, and are prepared to be the best solution via Google’s Answer Engine. By providing social proof, simplifying your solutions, and building curiosity, you can convert leads into customers. We anticipate that Google will continue to incorporate structured data in SERPs and push the limits of “knowledgeable answers” displayed on Google results, moving the search engine ever deeper and better and providing what users are looking for. If you don’t answer the user’s questions, someone else will. Why lose the chance to build your brand? The truth of the matter is that Google is often providing responses to user questions that aren’t from the company itself that is trying to reach people. In fact, Google Local Guides are doing most of the answering. These people are offered points, badges and other incentives to try get answers out there. They are notified by the Search Giant every time there is a question asked that Google wants a better answer for and they get encouragement to go about answering those questions. They may not know how to answer as correctly as you do. And their answer probably won’t help your business like the best answer on your own site can. That is why you will do bet to be answering these top user questions directly yourself! Read how Google seeks a QA system that learns to Google seeks to reformulate questions to elicit the best possible answers. Google also exlains how it’s dataset is used to for naturally occurring queries and focus on finding answers by reading an entire page, rather than extracting answers from a short paragraph. In my opinion, this aligns with contextual search. while establishing NQ, the Search Giant begin with “real, anonymized, aggregated queries that users have posed to Google’s search engine”. Twitter: Twitter hashtag #AskMeAnything is another way to let your followers know that you are ready to provide whatever they need. Reditt: Reddit’s question-and-answer format highlights the aspirational norms of honesty and authentic conversations from Internet forums and takes them mainstream. Quora: Quora provides “Short Answers”; it revolves around users are customers. AnswerThePublic.com: Check out what is going on there, what questions and queries your consumers have, and who is answering what. You may come away with ideas for a fantastic one-pager that prompts dialog on how you could start answering your clients better. Your product is just as much what you put on user’s screens. They are not purchasing code. They’re buying a user interface in the journey to buying your product. A shoppers measure of your product is whether your user interface and content makes it easy or hard. The Google Answer Engine is sure to be tested in multiple ways and may have a formal title one day from the company itself. What remains the same is that people ask a lot of questions. That said, customer expectations for answersand the customer evolutionary cycle toward purchasing are definitely going through a steep change. A return to providing what users want takes us back to the essentials of those one-on-one conversations with people online. New innovative ways to help them find your answers are like magic connections. Prepare great answers in advance by anticipating frequently asked questions. Focus on uncovering your users’ state of mind. And remain humble and open as you provide answers vs a “know it all” attitude. Don’t forget that technical SEO can make or break the functionality of your pages. As you invest work and money into solution-rich online content, it’s important to remain balanced by embracing SEO and eliminating critical barriers to user engagement. Content is great, but the more you have, the more you may be creating a need to provide those answers on a page whose performance is sound.